An MGS Oblique view of Olympus Mons using the Malin MOC instrument . Mars Global Surveyor is famous for taking many "top down" images of Mars that have revolutionised how we perceive Mars. Mars Reconnaissance Orbiter bases many of it's observations on investigating features first discovered by MGS (of course probes like Mars Odyssey also figure strongly in their research material). What MGS is less well known for is it's "oblique" views. Taken to monitor dust storms and clouds, and the "limb" of Mars, these views are incredible, not often seen, views of the Red Planet that you might see as you look out of the porthole of some spacecraft. Another MGS Oblique view of Olympus Mons using the Malin MOC instrument . 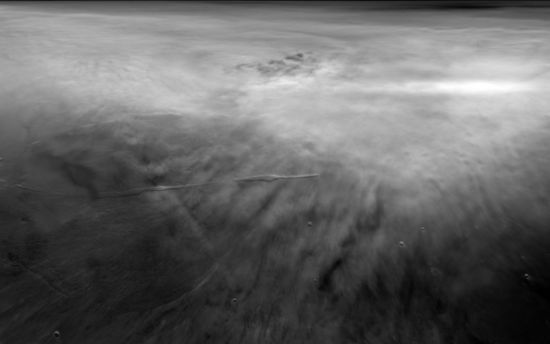 Oblique view of Arsia Mons looking east . These incredible images show that Mars has a healthy atmosphere, which although very different to the one on Earth, nevertheless has dust storms, haze, and a "terminator" between the Mars atmosphere and space. The nature of the "top down" images do not show this, leading to the erroneous impression of a "dead cold" Mars. Both the ESA Mars Express, and Mars Reconnaissance Orbiter have similar capabilities and a Scientific agenda to study the Mars atmosphere so will will see further "panoramic" oblique views from these orbiters. ↑ R0500192 browse page at Malin Space Science Systems. 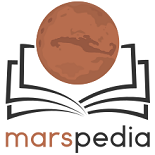 ↑ R0801953 browse page at Malin Space Science Systems. R0801953 location in NASA WorldWind. ↑ R0500315 browse page at Malin Space Science Systems.